Unless you plan on going into an operation unprepared you absolutely need a good sight that works at various brightness settings, is extremely durable and will last you for quite a while. The Vortex StrikeFire is certainly a sight to look out for as far as all the previous things are concerned. It is made with a standard 30 millimeter tube, making it possible to mount on most typical extensions. 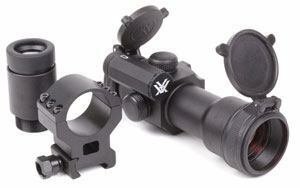 The one piece tube design makes this sight extremely durable and shock proof. It is also waterproof and is not in the least hindered by fog or moisture thanks to its special coating. The scope comes with two protective lens covers. It works with a 4MOA DOT. The windage and elevation of the Vortex StrikeFire can be easily adjusted to your preferences with a simple dial. This amazing sight is certain to please even the harshest of critics and most experienced veterans with its superior design, simple practicality and extremely good vision enhancement. So, unless you wish to work with less than you deserve, you should look into buying one of these amazing sights for yourself. Because we all know that a customized weapon is a superior weapon and what best to customize your weapon with than a Vortex StrikeFire sight!